Went for a walk starting at Little India in central part of Singapore in early April 2011. 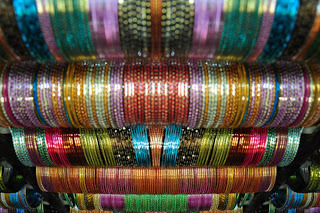 Little India always fascinates me as it's a totally "new" place when taking photos i.e. 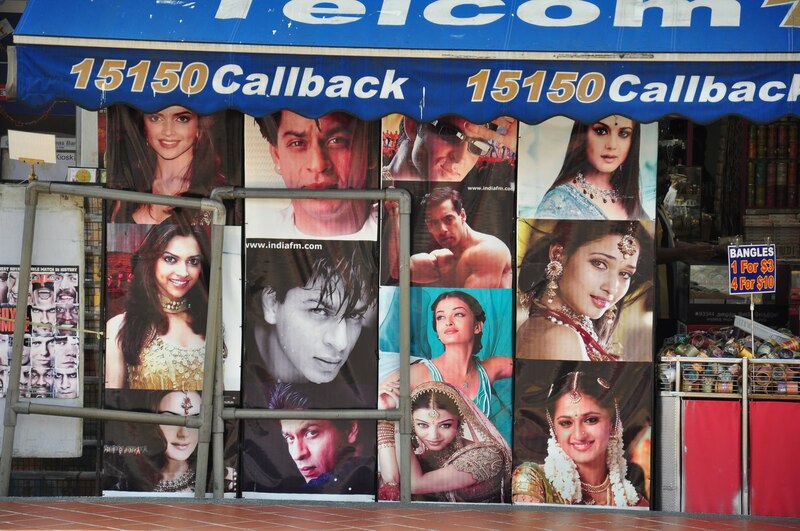 you don't get to see some of the things in Little India anywhere else in Singapore e.g. handicraft, posters, food, architecture etc. 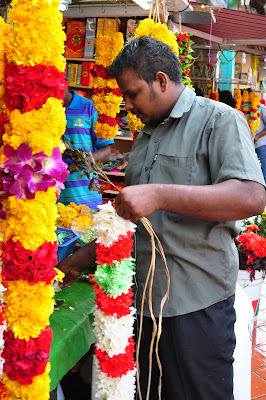 Here's a photo of the "famous" flower garland maker.....almost always the men are the ones making the extremely long garlands filled with perfumed flowers. Now, this comment just gave me an idea that perhaps the tourism body here should have a skill display of some sort for these people who can then reach out to those interested in learning more about stringing their own garland. Will probably make the tourist experience more enriching! 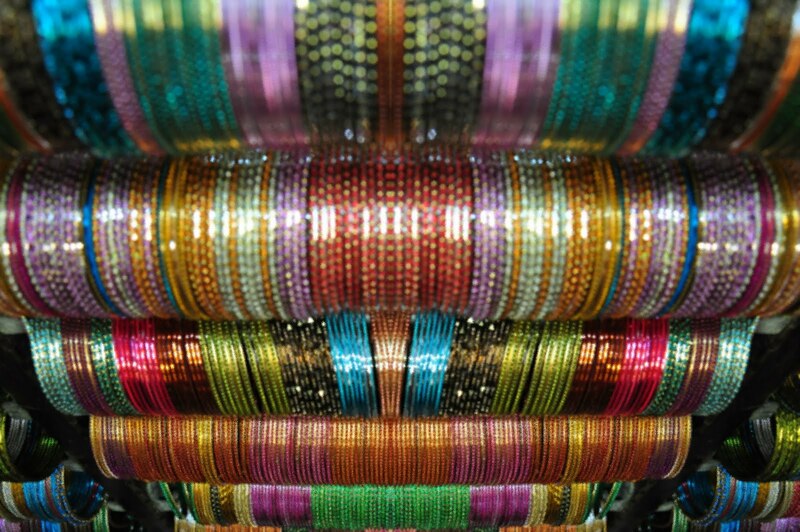 Over here, you can also find bangles of every single color in the rainbow & more! 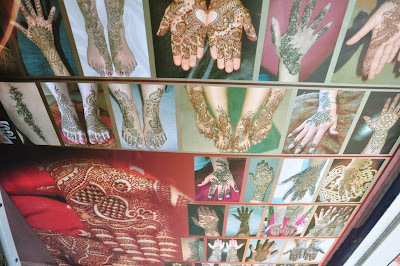 The other extremely unique handicraft that you can only find in this location is "henna" which is actually a temporary tattoo applied using plant dyes on your hand, arms and/or feet. It's a lovely art form as it takes a steady hand and a creative mind to come up with all the wonderful intricate designs that the ladies will simply love!!! Natural henna (dark brown) is preferred as it simply wears off after a few days... of course with everyone "wow"ing at your body art! The photo buff group I went with this time were extremely adventurous as not only we went around Little India, we even ventured down past the Thieves Market near Arab Street area before heading down the Malay enclave at Arab Street before ending our photo-walk at Bugis area! More of those other fabulous places in later posting when I take my breath before the next posts! Needless to say, it was definitely an extremely productive shoot on that day. Till the next time, off to the world & beyond!